The borough of Sefton as created on 1 April 1974 with the Local Government Act 1972. It merged Bootle and Southport which were former county boroughs as well as several parts of the administrative county of Lancashire. It is one of the consisting parts of the county of Merseyside. The population of the borough is about 275 thousand people and covers an area of some 60 mi². When it comes to proving removal services for our customers our company makes takes no shortcuts. This is why if you need to hire a man and van in Sefton you should give us a call. We are the leader among regional moving companies. With the best quality of service and highest level of professionalism we take the edge over our competitors. 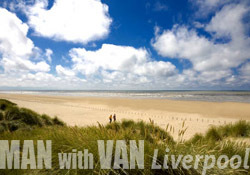 We are the right choice for anybody who needs a man with van in Sefton, regardless the load or the location – our vans can handle any size and weight and our drivers can transport anything safely. Sefton is the name of a village and parish with population of about 750 to 800 people. The name is of Old Norse origin and translates roughly as sedge farmstead. The choice of the name was probably influenced by the choice for name of the neighboring borough Knowsley – i.e. they chose a name derived from the names of local noble families. Sefton is a prime target for tourists. The main tourist attraction is the Aintree Grand National which is the most valuable horse race in Europe. Other notable points of interest are Antony Gormley’s Another Place artwork on Crosby beach and Royal Birkdale Golf Club which is a regular Open Championship venue. People who enjoy nature are attracted to it’s 22 mile coastline. Sefton borough is also notable as home to one Britain‘s last red squirrel populations. 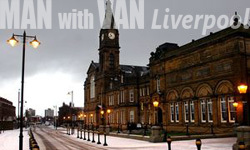 Call 0151 554 9058 and hire one of our vans. We hire only people with high qualification in the area of removal services. All our employees are experienced movers with years of practice behind their back. They are specially trained to deal with different types of loads – furniture, home appliances, tech items, office items like computers and copy machines etc. If you use our moving services in Sefton you are making a safe bet for your removal. Every piece of furniture of your home or office will be handles with utmost care and transported in perfect condition to its new location. We ever offer packaging you don’t have to bother if you don’t have the time of the right wrapping materials. We try to keep the process of a removal as fluent and flexible as possible. You are the ones who determine the date, time and place for the removals in Sefton. Tell us when and where and we will send people to your location. And if it turns out that one van is not enough you can call for another one on the spot – no delays, everything is done as fast as possible. We realize we do not necessarily offer the cheapest service for man and van in Sefton but we offer the most affordable one that doesn’t sacrifice quality. And with no hidden costs, flexible pricing and order individualization if somebody tells you they can offer you a better man with van in Sefton deal – they’re lying. Feel free to contact us via email of phone for a free quotation.